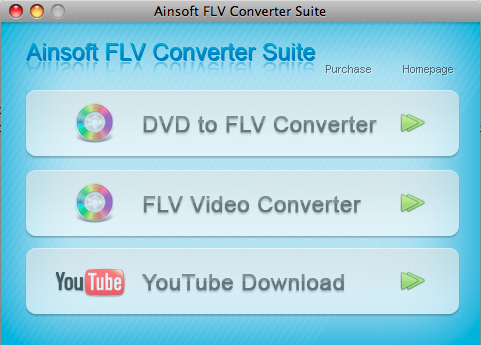 Ainsoft FLV Converter Suite for Mac, an awesome Mac FLV conversion suite that includes DVD to FLV Converter for Mac, FLV Video Converter for Mac and Free Mac YouTube Download. Using this professional Mac FLV apps, you can not only rip or convert DVD to FLV(Flash Video) and SWF, but also convert the most popular video formats to FLV or SWF, then enjoy various videos with FLV format and upload converted FLV files to Youtube, Google Video, Myspace, Yahoo Video or any other video sites and blogs, such as convert AVI to FLV, MPEG to FLV, MP4 to LFV and WMV, MKV, MOV, RM, 3GP to FLV, etc. Ainsoft DVD to FLV Converter for Mac and FLV Video Converter for Mac can be used as a video player because we can preview the movies before converting. The quality and definition of the movie that played through preview window is as perfect as the original ones.